The refresh rate (most commonly the "vertical refresh rate", "vertical scan rate" for CRTs) is the number of times in a second that a display hardware draws the data. This is distinct from the measure of frame rate in that the refresh rate includes the repeated drawing of identical frames, while frame rate measures how often a video source can feed an entire frame of new data to a display. On CRT displays, increasing the refresh rate decreases flickering, thereby reducing eye strain. However, if a refresh rate is specified that is beyond what is recommended for the display, damage to the display can occur. 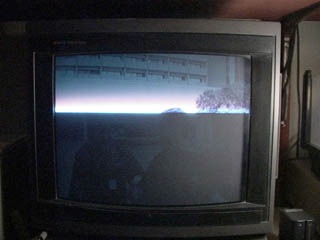 In a CRT, the scan rate is controlled by the vertical blanking signal generated by the video controller, ordering the monitor to position the beam at the upper left corner of the raster, ready to paint another frame. It is limited by the monitor's maximum horizontal scan rate and the resolution, since higher resolution means more scan lines. The refresh rate can be calculated from the horizontal scan rate by dividing the scanning frequency by the number of horizontal lines multiplied by 1.05 (since about 5% of the time it takes to scan the screen is spent moving the electron beam back to the top). For instance, a monitor with a horizontal scanning frequency of 96 kHz at a resolution of 1280 × 1024 results in a refresh rate of 96,000 / (1024 × 1.05) ≈ 89 Hz (rounded down). CRT refresh rates have historically been an important factor in electronic game programming. Traditionally, one of the principles of video/computer game programming is to avoid altering the computer's video buffer except during the vertical retrace. This is necessary to prevent flickery graphics (caused by altering the picture in mid-frame) or screen tearing (caused by altering the graphics faster than the electron beam can render the picture). Some video game consoles such as the Famicom/NES did not allow any graphics changes except during the retrace (the period when the electron guns shut off and return to the upper left corner of the screen). While flicker does not occur on LCD displays, it is still necessary to avoid modifying graphics data except during the retrace phase to prevent tearing from an image that is rendered faster than the display operates (LCDs normally always refresh at 60 frame/s). CRTs have the unique ability to use light guns and pens. These are devices with a photosensor that detects the electron beam and sends a signal to the attached computer. This can be used to determine if a specific graphics object is on the screen. The light gun is a larger variant used in arcade games and some consoles. Unlike light pens, they are held at a distance from the screen. Light pens and guns cannot be used on fixed-pixel displays because they have no electron beam to detect. Pen tablets and touchscreen LCDs are used as a substitute for them, but the latter require a specially-designed LCD panel and are mostly only found in point-of-service monitors. The Nintendo DS is an example of a video game system that has a touchscreen LCD. Refresh rate or the temporal resolution of an LCD is the number of times per second in which the display draws the data it is being given. Since activated LCD pixels do not flash on/off between frames, LCD monitors exhibit no refresh-induced flicker, no matter how low the refresh rate. High-end LCD televisions now feature up to 600 Hz refresh rate, which requires advanced digital processing to insert additional interpolated frames between the real images to smooth the image motion. However, such high refresh rates may not be actually supported by pixel response times and the result can be visual artifacts that distort the image in unpleasant ways. On smaller CRT monitors (up to about 15"), few people notice any discomfort below 60–72 Hz. On larger CRT monitors (17" or larger), most people experience mild discomfort unless the refresh is set to 72 Hz or higher. A rate of 100 Hz is comfortable at almost any size. However, this does not apply to LCD monitors. The closest equivalent to a refresh rate on an LCD monitor is its frame rate, which is often locked at 60 frame/s. But this is rarely a problem, because the only part of an LCD monitor that could produce CRT-like flicker—its backlight—typically operates at around 200 Hz. Different operating systems set the default refresh rate differently. Microsoft Windows 95 and Windows 98 (First and Second Editions) set the refresh rate to the highest rate that they believe the display supports. Windows NT-based operating systems, such as Windows 2000 and its descendants Windows XP, Windows Vista and Windows 7, set the default refresh rate to a "conservative" rate, usually 60 Hz. The many variations of Linux usually set a refresh rate chosen by the user during setup of the display manager (although a default option is usually included with xfree86). Some full-screen applications, including some games, allow the user to reconfigure the refresh rate before entering full-screen mode, but most default to a "conservative" resolution and refresh rate and let you increase the settings in the options. When LCD shutter glasses are used for stereo 3D displays, the effective refresh rate is halved, because each eye needs a separate picture. For this reason, it is usually recommended to use a display capable of at least 120 Hz, because divided in half this rate is again 60 Hz. Higher refresh rates result in greater image stability, for example 72 Hz non-stereo is 144 Hz stereo, and 90 Hz non-stereo is 180 Hz stereo. Unfortunately most computer graphics cards and monitors cannot handle these high refresh rates, especially at higher resolutions. When the first televisions were developed in the 1920s and 1930s, the limitations of vacuum-tube electronics made it difficult to run them at anything other than a multiple of the AC line frequency used to power the set. Thus producers had little choice but to run sets at 60 Hz in America, and 50 Hz in Europe. Using the AC power frequency for the vertical sync rate also ensured that any residual power supply ripple (which would be visible as horizontal bands) was stationary. If a different frequency is used the "hum bars" move and thus are more distracting. These rates formed the basis for the NTSC (60 Hz) and PAL & SECAM (50 Hz) sets used today. This accident of chance gave European sets higher resolution, in exchange for lower frame-rates. Compare NTSC (704x480 NTSC at 30i) and PAL/SECAM (704x576 at 25i). However, the lower refresh rate of PAL/SECAM introduces more flicker, so sets that use digital technology to double the refresh rate to 100 Hz are now very popular. Another difference between 50 Hz and 60 Hz standards is the way motion pictures (film sources as opposed to video camera sources) are transferred or presented. 35 mm film is typically shot at 24 frame/s. For PAL 50 Hz this allows film sources to be easily transferred by accelerating the film by 4%. The resulting picture is therefore smooth, however, there is a small shift in the pitch of the audio. NTSC sets display both 24 frame/s and 25 frame/s material without any speed shifting by using a technique called 3:2 pulldown, but at the expense of introducing unsmooth playback in the form of telecine judder. Unlike computer monitors, and some DVDs, analog television systems use interlace, which decreases the apparent flicker by painting first the odd lines and then the even lines (these are known as fields). This doubles the refresh rate, compared to a progressive scan image at the same frame rate. This works perfectly for video cameras, where each field results from a separate exposure - the effective frame rate doubles, there are now 50 rather than 25 exposures per second. The dynamics of a CRT are ideally suited to this approach, fast scenes will benefit from the 50 Hz refresh, the earlier field will have largely decayed away when the new field is written, and static images will benefit from improved resolution as both fields will be integrated by the eye. Modern CRT-based televisions may be made flicker-free in the form of 100 Hz technology. Many high-end LCD televisions now have a 120 or 240 Hz (current and former NTSC countries) or 100 or 200 Hz (PAL/SECAM countries) refresh rate. The rate of 120 was chosen as the least common multiple of 24 frame/s (cinema) and 30 frame/s (NTSC TV), and allows for less distortion when movies are viewed due to the elimination of telecine (3:2 pulldown). For PAL at 25 frame/s, 100 or 200 Hz is used as a fractional compromise of the least common multiple of 600 (24 x 25). These higher refresh rates are most effective from a 24p-source video output (e.g. Blu-ray Disc), and/or scenes of fast motion. The combination of content production, playback device, and display device processing may also give artifacts that are unnecessary. A display device producing a fixed 60 frame/s rate cannot display a 24 frame/s movie at an even, judder-free rate. Usually, a 3:2 pulldown is used, giving a slight uneven movement. While common multisync CRT computer monitors have been capable of running at even multiples of 24 Hz since the early 1990s, recent "120 Hz" LCD displays have been produced for the purpose of having smoother, more fluid motion, depending upon the source material, and any subsequent processing done to the signal. In the case of material shot on video, improvements in smoothness just from having a higher refresh rate may be barely noticeable. In the case of filmed material, as 120 is an even multiple of 24, it is possible to present a 24 frame/s sequence without judder on a well-designed 120 Hz display (i.e., so-called 5-5 pulldown). If the 120 Hz rate is produced by frame-doubling a 60 frame/s 3:2 pulldown signal, the uneven motion could still be visible (i.e., so-called 6-4 pulldown). For computer data and telemetry, the term is also used to refer to the frequency of updates to a piece of data from an external source. This might be expressed in any unit of time.